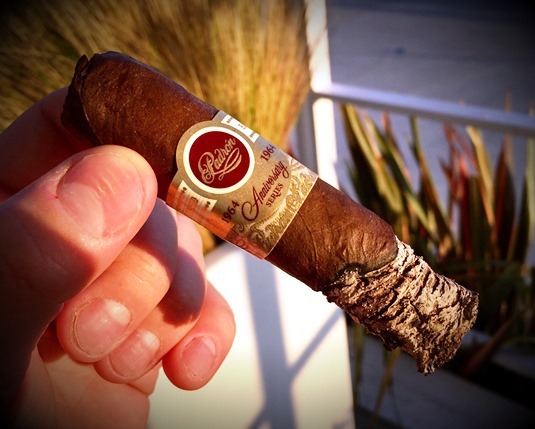 Earlier this month, I reviewed the Padrón Serie 1964 Prototype Natural, the result of an arrangement between Padrón and Smoke Inn whereby the latter has exclusive distribution on one-time release of a vitola that isn’t available elsewhere. In essence, what the Prototype Maduro offers is the ability to smoke the famed Serie 1964 blend in an otherwise unavailable format (4 x 50). I recently bought a 5-pack for $59.75 ($11.95 per cigar). At the time of this writing, 5-packs and boxes of 20 of both the Natural and Maduro are still available at Smoke Inn. As you would expect given the pedigree and price, the Prototype Maduro leaves nothing to be desired in terms of appearance. The familiar 1964 double-ring band is very reassuring; it reinforces the only thing that’s “prototype” about this cigar is the format. Everything else—the quality of the tobacco, the craftsmanship of the construction, etc.—should be up to the high Serie 1964 standards. The exterior leaf is thick and oily with ample tooth and only very thin veins. Once lit, pre-light notes of cocoa and caramel transition to a medium- to full-bodied profile of espresso, dark chocolate, and white pepper spice. The draw is effortless and the smoke production well above average. The flavor might be rich and thick, but the texture is actually light and sweet—almost marshmallow-esque. The sweetness is nicely offset by some salted caramel and cayenne heat, especially in the second half. As I wrote in my review of the Natural iteration of this cigar, I don’t think I’m going to surprise anyone when I say the Padrón Serie 1964 Prototype Maduro is a terrific smoke. It’s a compact, concentrated iteration of a blend we all know and love that delivers exactly as expected. For my money, I would give the slight edge to the Maduro, which also earns a very impressive rating of four and a half stogies out of five.